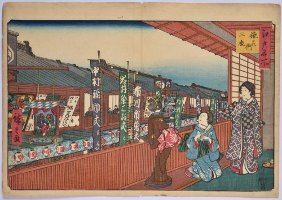 The Sanza Theatre, Saruwaka-cho showing women on the balcony of a tea-house overlooking the street from an oban set Edo Meisho of approx. 45 prints published by Yamada-ya, 1853 – 1858, half being published in 1853. This design published 1858. Fine impression and colour. Slight centre fold, otherwise good condition. Signed Hiroshige ga.